Thomas Bjorn set the pace on the opening day at Sentosa Golf Club, shooting five-under-par to lead by a single shot. DENMARK’S THOMAS BJORN held a one-shot clubhouse lead in the $6 million Barclays Singapore Open as a thunderstorm halted play with half the field yet to complete the first round. World number one Rory McIlroy, level-par through eight holes, was among 78 players affected by the overnight suspension — which came after officials said they’d like to change the event’s dates because of its notorious weather delays. Bjorn shot a scintillating five-under-par 66 at the demanding Sentosa Golf Club to lead England’s Simon Khan, Chinnarat Phadungsil of Thailand and Spain’s Pablo Martin by a stroke. England’s Paul Casey continued his hot run of recent form to lie two off the pace at three-under-par 68, alongside South Korean Major-winner Y.E. Yang and Thai pair Kwanchai Tannin and Chapchai Nirat. But America’s Phil Mickelson, sporting bright pink trousers, crashed to a 73 including a double-bogey on the par-three 14th hole, when it took him two shots to get his ball one yard out of thick rough and on to the green. Bjorn carded six birdies against one bogey for his best opening round since February, as the Ryder Cup vice captain seeks his first tournament victory of the year. “It’s not the longest golf course in the world so if you can keep it in the fairway, you can produce a score, and I did that very well today. That’s only round one, so we’ll work from here,” he said. The early group played in sauna heat. But after McIlroy, watched by his tennis star girlfriend Caroline Wozniacki, had shot two birdies sandwiched between two bogeys, dark clouds gathered and play was stopped due to the risk of lightning. Players will be back on the course at 7:30am on Friday with organisers hoping to cram one-and-a-half rounds into one day. Email “Rain halts McIlroy as Bjorn takes Singapore lead”. 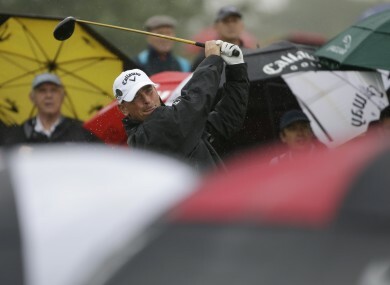 Feedback on “Rain halts McIlroy as Bjorn takes Singapore lead”.